I have been very excited about this post because it is my first ever guest post! So I hope you’ll all go easy on me. I came across this blog on Blog Frog and found that the lovely Jeanette was more than eager to accept a guest post of any recipe I chose. As a vegan I figured that people would be less likely to accept a recipe from me.. but thankfully Jeanette was very open minded. Please don’t be turned off by this being a vegan recipe. You yourself, probably eat vegan all the time and didn’t even know it. I have to say I absolutely love the idea of Freezer Foods Friday.. Freezer foods are ridiculously wonderful and my favourite part of the recipe I am sharing with you today is that it can be left frozen for up to one month. There’s nothing better than wanting some dessert after dinner and all you have to do is grab it out of the freezer and put it in the oven for a rich, gooey, hot apple pie. 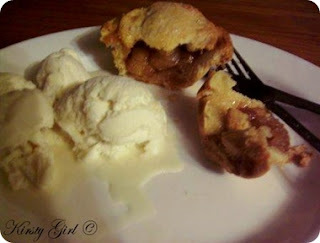 This recipe will make 4 individual apple pies. 4 apples, peeled, cored, chopped (Usually apple pie recipes call for Granny Smith apples, but I just use whatever I have on hand, easy and just as yummy). 1 tbs lemon juice (If you’re lucky like me, you’ll just have to run outside and grab a lemon off your tree for this one). soy milk (or anything just to brush the pastry with, you could probably do without anything even, if needed). Ice cream, to serve (Vegan of course, the apple pies are sweet enough to do without the ice cream though, it’s just an added bonus. These apple pies are far from dry, so you won’t need it). 1. Place apple, caster sugar, lemon juice, cinnamon and 2 tbs cold water in a saucepan over medium-high heat. Cook for 4 minutes or until apple has softened. 2. Combine cornflour and 1 tbs cold water in a small bowl. Add to apple mixture and bring to the boil. Remove from heat. Cool. 3. Lightly grease 4 holes of a 3/4 cup capacity muffin pan. Cut out your pasty (I use a 14cm round, serrated pie cutter for my base, and an 8cm round egg ring for the top. But you can use anything you have handy, so long as you have a base around 12-14cm and a top around 8-10cm). 4. Line holes with larger pastry rounds. Fill with apple mixture. Brush edges with soy milk. Top with smaller pastry rounds. Brush with soy milk. Sprinkle with sugar. 5. If you don’t want to freeze your pies and want them right away, you can skip this step. Wrap muffin pan with foil. Freeze for up to 1 month. 6. Preheat oven to 180°C/160°C fan-forced (Yes, I’m an Aussie). And for you Americans that’s 356°F/320°F fan-forced, according to Google. 7. Place muffin pan on a baking tray (I’ve never had any trouble with spillage myself but better safe than sorry) and bake for 45 minutes or until golden and heated through. Check after 30 minutes to make sure it’s not getting too brown. Hope you decide to make my apple pies! Believe me, you won’t be sorry. And thank you so much to Jeanette for the opportunity to do my first ever guest post! Kirsty – Please stop by and say “Hello” @ my blog Kirsty Girl. Also I think caster sugar is American "superfine sugar". Those little pies look so sweet and I think the recipe will easily work for non-vegans too. Nothing strange and overly "healthy" there that I can see. I love the muffin tin idea for little individual pies and freezing them to bake fresh when the apple pie urge hits you is great! Thanks for sharing. Yum! I'm an apple pie lover! Really, I just love apples. Don't get me started about that! ^_^ And I popped over to check out Kristy's blog too!! Fun! Sounds great ... Can Cater sugar and corn flour be subbed with regular sugar and corn starch? These are so freaking adorable. I have to make them! And I'd love a guest post by either of you any time! My husband LOVES apple pie. And these look so good! I have to admit, I don't know what caster sugar is though? BTW- congrats on your first guest post Kirsty!! Hello...............yummy, yummy, yummy! I am absolutely loving these babies....so cute, and I am sure so delicious! 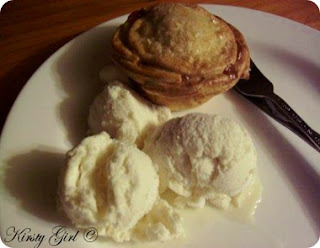 My sis makes the best apple pie, haven't found one to top it but I am trying these!!! Love apple anything. Thank you for sharing! Janese: I have no idea but I don't see how it could make too much of a difference. So I say go for it. Before I sent this recipe through to Janette I assumed in America that you all knew what castor sugar was. Here in Australia it's what we use for most sweet things in cooking! I was very surprised when Jenette asked me what it was.